I’ve been wanting to upgrade the blade in this plane since I restored it a while back. 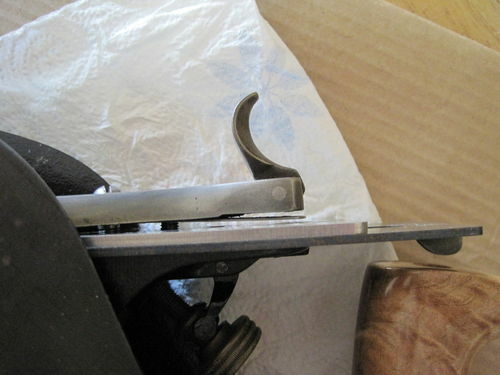 The iron is almost gone and pitted badly and the cap iron is mainly what has prevented this plane from being used in my shop as it chatters really bad. I’ve tried sharpening and flattening the blade, and re-shaping the cap iron but it’s warped so bad it will never work. I finally put out the cash for a blade I picked up from Woodcraft but they didn’t have a cap iron in 2-5/8” wide for my old #8 Stanley so I had to order that from Hock’s website. It cost me an extra $10 in shipping but there’s no way I was about to put this new blade with the worn out cap iron, so I had to let it sit until the new one arrived. It was a long week. I must commend Hock for taking a minimalist approach to shipping product. The new cap iron arrived in a cardboard document shipper envelope and inside was two cardboard pieces tacky glued together sandwiching the cap iron. The cap iron itself was wrapped in what looked like newspaper but was the instructions for sharpening the blade. That was it, no plastic, no extra advertising stuff that would just end up in the trash. For that, I say “Nicely done Hock”. Well, everything looked great until I put it all together on my plane and I found that the lever cap wouldn’t work right. Upon closer inspection I saw that the thumbscrew for the blade and cap iron was sticking out the top of the cap iron about 3/16”, just enough to push up on the lever cap thereby preventing the lever from contacting the cap iron. I sent an email to Hock asking for suggestions, Ron Hock himself replied within ten minutes I think. He said that it’s unusual for the protruding thumbscrew to interfere with the lever cap so he was going to get a shorter one in the mail to me. Well, I waited until the end of the week and I couldn’t take it anymore, so today I cut the end of the screw off, dressed up the threads and put it together. When the new screw comes in I’ll put that one in and use it. When setting up the blade on the frog I did notice that the mouth needed to be opened up a bit. I had read about this and I understand that sometimes it’s not needed. It was needed on mine, it would have contacted the other side of the mouth otherwise. So I put the plane in my vise and made a guide mark using a square, then filed it down, I think I only went 1/32” maybe. I was careful to make sure the new edge was straight and the ends of the mouth were square. After setting it up I put a piece of ash that had some ripples from the planer in the vise and tried it out. It not only flattened it out, but it left a mirror finish on the board? It was so easy to push through, I couldn’t believe it was cutting but the shavings just piled up. The biggest thing though was not once did it chatter. I give Hock Blades five starts for the product (I’d give six if I could), but 4.5 stars for the inconvenience of the thumbscrew. It’s so hard to be patient isn’t it? Alas, we all suffer terribly when we know our prize is in the mail! Good review and I appreciate the packing info. Nice to know he’s keeping it simple. From all that I’ve read and heard, it Hock hands down. Glad to hear it worked out for you. I bought a IBC that I’m fine with. In fact, it’s the best iron I have. Gonna try the Hock #3 and #4 soon.